The real estate market is constantly changing. One of the most valued currencies available is trust and credibility. With that preface, welcome to the market report for the Charlottesville area for November 2007. 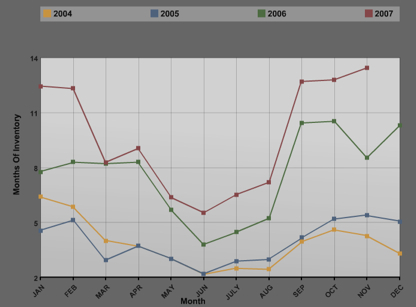 This month I am including data from 2004, 2005, 2006 and 2007. – Read beyond the headlines. – There is no “national” or perhaps even “regional” real estate market. Every market is different, and markets often vary street by street or neighborhood by neighborhood. For example – the neighborhood that is stable, in a great location and is desirable is going to be in better shape than the neighborhood that shares a border with a new construction development that has seen its asking prices slashed by twenty or thirty percent. – Things are selling, and now is regarded by many to be an excellent time to buy – so long as you are looking to buy for an appropriate timeframe. Rates are at historical lows. – No amount of spin can detract from the fact that this correction was needed and will be painful for some. However … all is not bad. People still need places to live. – Due diligence and statistical analysis on every real estate purchase and sale should be performed prior to every transaction. – The data, while skewed by inaccuracies here and there, offers the best trending information available. – For the entire Charlottesville MSA, the absorption rate for our inventory is currently more than four times that of November 2004 and five months more than November of 2006. – Days on market for the entire area is slightly higher than this time last year. – Average sales price is higher than the average sales price in 2004, but lower than 2005 and 2006. – Median Sales price numbers are interesting and all over the board. – It is very difficult to pull new construction data out of the MLS statistics, and even then, the data is often grossly inaccurate for myriad reasons, so I go with what is there. – The data is only as good as the people doing the input. – Buyer and Seller psychology are very difficult, if not impossible, to quantify. The year end report should be equally fascinating, and I will revisit my predictions from earlier this year and make new ones for next year. How low will the Realtor membership decline? *Including Albemarle, Augusta, Charlottesville, Fluvanna, Greene, Louisa, Nelson, Waynesboro below the fold. *All market statistics that I have written can be found here. 2007 information for the entire region. 2006 information for the entire region. There is more to the above data that I am digging into for a later story. Waynesboro and Augusta are included because they are becoming more and more a part of our market, but the data remains quite incomplete.